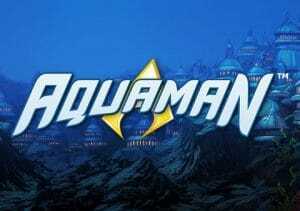 The latest member of the Justice League super hero team to be given the video slots treatment is Aquaman. Created by Playtech, it’s a suitably classy looking 5 reel, 243 ways to win video slot. As you’d also expect, it comes with plenty of extras including respins with locked wilds, streak respins and a free spins round with wild multipliers of up to 4x plus symbol upgrades. You could also win 1 of 4 possible progressive jackpot prizes. Play on your PC, tablet or mobile from between 25p and £500 per spin. Like the other video slots in Playtech’s DC Comics series, the design in Aquaman is very well done. There’s a comic book look to the visuals. The reels are set against the ocean city of Atlantis. There you’ll find lower value A to 10 symbols alongside a selection of sea monster supervillains. Mera, Queen of Atlantis and wife of Aquaman appears in the base game only and pays up to 14 times your bet. Aquaman himself is the most rewarding symbol. Land 3, 4 or 5 on adjacent reels for a payout of 3, 6 or 20 times your bet. Look out too for the trident which is wild. There are plenty of extras to get stuck into in Aquaman. Trident Wild Respins feature – land Aquaman fully stacked on reel 2 and you’ll win a re-pin with Aquaman’s trident turning 3 adjacent symbols wild. The process is repeated until a winning combination lands. Ocean Rush Respins feature – Mera fully stacked on reel 4 triggers this streak spin. 1 symbol is selected and the reels spin again. All instances of the special symbol lock in place. The respins continue as long as a new matching symbol hits. A final payout calculation is then made. If you’re lucky enough to land Aquaman on reel 2 and Mera on reel 4 on the same spin, then the 2 respin features are combined to potentially spectacular effect. Atlantis Free Games feature – 8, 12 or 16 free spins are on offer if you land 3, 4 or 5 scatters on the same spun. Collect golden Aquaman symbols here to upgrade the monster symbols into Aquaman. Collecting 4, 8, 12 or 16 upgrades 1, 2, 3 or 4 symbols. Also spicing up the feature are the wild multipliers. These can boost payouts by 2x, 3x or 4x when they form part of a winning combo. You can also win unlimited additional free spins by getting 2 or more scatters on a free spin. Jackpot Game feature – you’ll also have a chance to land a potentially life altering sum as Aquaman is part of the DC Super Heroes Jackpot network. Once triggered (which can happen randomly on any spin), choose from the grid to determine which of the 4 jackpots you’ve won. He’s not as well-known as Batman or Superman but this latest addition to the DC Super Heroes video slots franchise is an enjoyable one. The high spec design is very well done and the features deliver plenty of action. Not content with standard features, Playtech has added a little something extra to the respins and free spins and they’re all the better for it. He’s certainly not the most high-profile superhero but Aquaman can deliver plenty of underwater action and it’s well worth diving in whether you are or aren’t a DC Comics fan. You can win 2,000 times your bet on every free spin if you benefit from the 4x wild multiplier. If you like superheroes, Suicide Squad (also by Playtech) is worth playing.